Birefringence (H) shifts through an array of incredible blues, purples, reds, oranges, yellows, and even subtle greens! 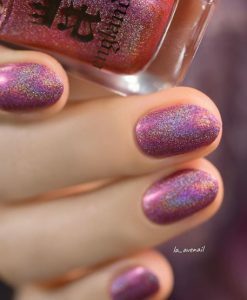 On top of that, you’ll love the stunningly crisp rainbow sparkle. 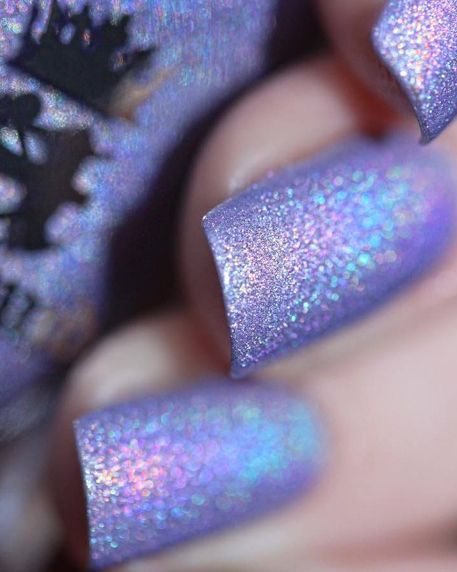 Birefringence (H) is part of ILNP’s “Ultra Chrome” class of chromatic nail polishes; formulated to apply directly to the nail without the need for a base color. This is a preorder item available between March 1st 9am AEST – March 7th 9pm AEST; with an approximate ship-by date to you of April 4th (if not beforehand). This item cannot be cancelled. 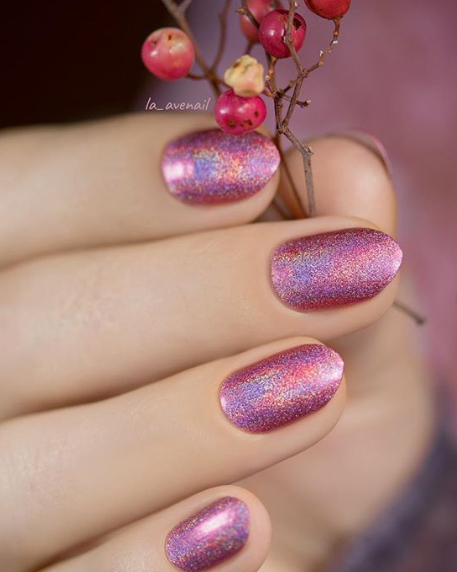 Ingredients: (Glitter Base) Ethyl Acetate, Butyl Acetate, Adipic Acid / Neopentyl Glycol / Trimellitic Anhydride Copolymer, Nitrocellulose, Styrene / Acrylates Copolymer, Isopropyl Alcohol, SD Alcohol – 40B, Sucrose Acetate Isobutyrate, Silica, N-Butyl Alcohol, Diethylhexyl Adipate, Benzyl Alcohol, Benzophenone-1, Violet #2 (CI 60725). (Color Base) Ethyl Acetate, Butyl Acetate, Nitrocellulose, Phthalic Anhydride / Trimellitic Anhydride / Glycol Copolymer, Isopropyl Alcohol, Sucrose Acetate Isobutyrate, Acrylates Copolymer, Stearalkonium Hectorite, n-Butyl Alcohol, Acetyl Tributyl Citrate, Camphor, Citric Acid, Benzophenone-1. (May Contain) Titanium Dioxide (CI 77891), Iron Oxides (CI 77489, CI 77491, CI 77492, CI 77499), Red 6 (CI 15850), Red 7 (CI 15850), Red 34 (CI 15880), Yellow 5 (CI 19140), Blue 27 (CI 75510), Black 2 (CI 77266), Mica, Aluminum Powder (CI 77000). Other: Every 12ml bottle is created by hand, with love, in the USA. 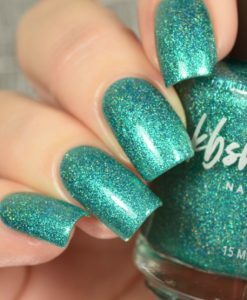 Each bottle of nail polish includes a stainless steel ball for easier mixing, a rubberized cap for better gripping, and a wide brush for easier application. All ILNP nail polishes are 3-Free! They DO NOT contain Toluene, Formaldehyde, or Dibutyl Phthalate. For external use only. Shake well before use as particle settlement may occur. 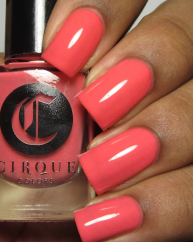 Apply 1-3 coats of nail polish then finish with top coat. 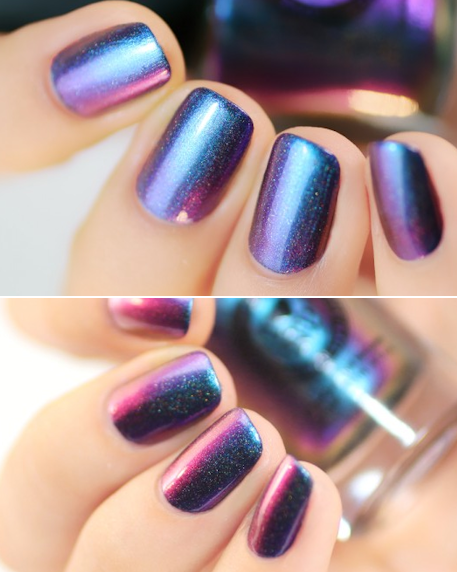 This nail polish is ridiculously beautiful. 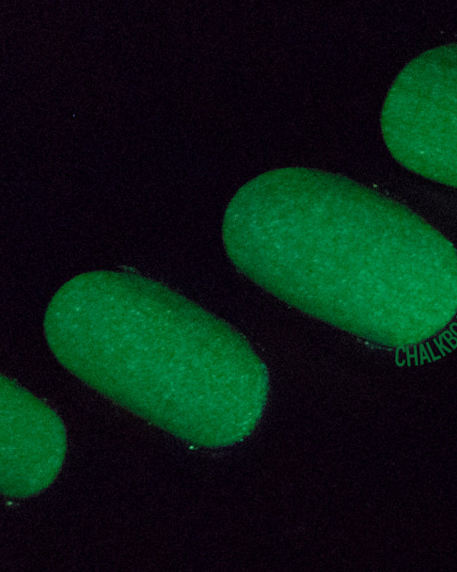 The holo’s subtle in most lights, but the duo-chromeiness is extreme. So extreme, it’s amazing! It changes colours dramatically and really easily depending on the light! It’s also surprisingly easy to apply, even with my shakey hands. 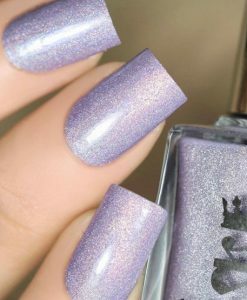 So this is gonna be the nail polish that stops me from chewing my nails, plus it gives me something to stare at when I get bored, instead of picking the nail polish off of my nails.